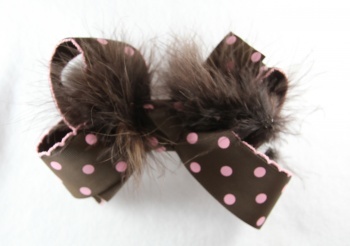 The chocolate brown Marabou feather in the middle will make you want to have this bow. The top is chocolate brown with light pink polka dots, which also wraps the middle into a French knot. Both ribbons are a 1.5" grosgrain that are layered through out this bow. Underneath is a chocolate brown moon stitch ribbon with pink ruffles on the edges. Lexa Lou likes feathers and I know you will too!